I have always enjoyed exploring a new topic with children. 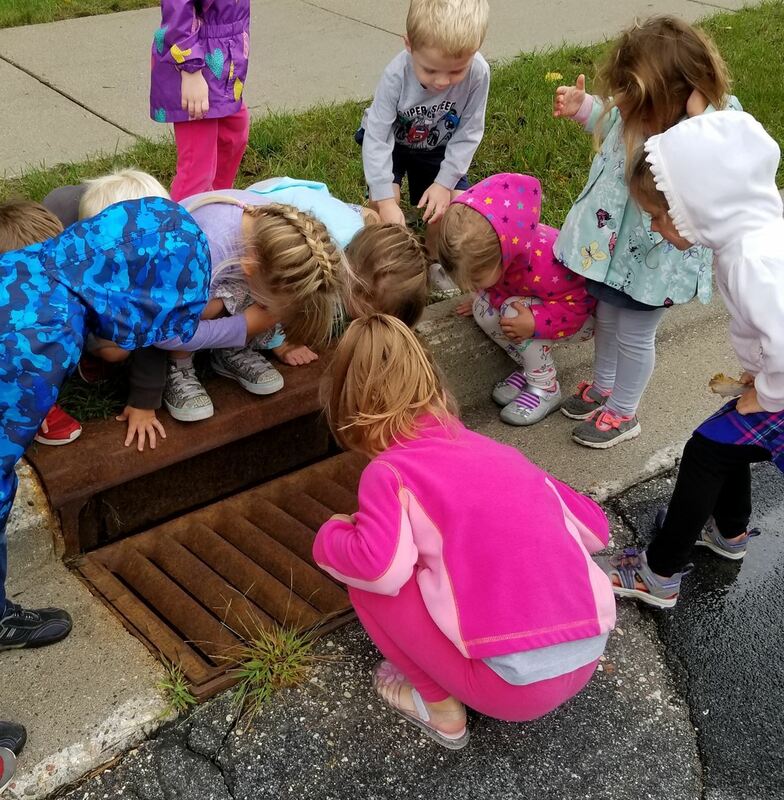 If I know nothing or very little about it, then I am sure we will learn together, as happened when children began exploring “sewers.” From the very first day, it was evident that this had the makings of a long-term exploration and deep investigation. How many times have you walked past the metal grill in the street next to the curb? Did you stop when you heard water rushing through? Did you look down, even get on your knees to look further? I have not. Neither had the teachers with whom I was working. But a group of children in their class were engrossed and delighted! At the newly formed South Metro Documentation Lab, our group collaborated on this exploration of sewers, sharing photos, conversations and drawings. During our discussion, we recognized how very little we knew about sewers. Our follow-up research made our lack of knowledge obvious. It is humbling to think that because the children were calling them “sewers” we did too. We realized these were not sewers, but storm drains. We made a plan to offer pictures of different views and types of what the children had seen, to discover more about the children’s knowledge. “In order to meet students where they are… you have to know the individual and collective zone of proximal development (ZPD) of your learners. ‘The ZPD is the distance between what children can do by themselves and the next learning that they can be helped to achieve with competent assistance.'" We did not share graphs showing both sewers and rain run-off drains with the children, but saved them for possible use later. We discussed how we did not want to influence or discount the knowledge they were formulating, nor should we introduce our research and terminology until they were further on in their investigation. We continued to observe, listen and think. One particular incident gave us a clue. Al: We have two sewers in back. We heard water. I keep hearing water going. An: There’s water underground in the dirt. It’s brown under there. It goes under the train. Now there’s leaves, not water. Garbage gets stuck and mixed up like a tornado. Sometimes there’s water by the railroad tracks and we can hear it coming down. We realized that the children had made the connection between the drains and the water run off in the lowlands and something “under” the train tracks. and develop their ideas by building different versions of “sewers.” They drew map-diagrams and built constructions with blocks and other loose parts. Increasingly, their focus was on what was underground, what they could NOT see. After the teachers thought the children had advanced their work and thinking, we introduced a detailed and uniquely formatted book about all that goes on underground.The Street Beneath My Feetby Yuval Zommer seemed to us to be a resource that could further the children’s knowledge. They became more interested in possibilities other than just rain run-off. We gathered the four most interested children to the art studio where we offered tubes, cardboard and other loose parts. We invited the children to represent their concept of what happens underground. There were several discussions and disagreements. At one point the children divided themselves into two groups and created an ‘’upper sewer” and “lower sewer.” Several times when they got stuck, they referred back to the map diagram that A. had drawn, paying special attention to clean water and dirty water and how it is kept separate. When considering the teachers’ thinking and choices, one can see these are very new steps in our journey. We see a lot we could have done differently, but we are gratifiedin our realization that we were all learning together step by step. The children’s exploration continues. Transportation to Madison is on your own. The Network will gather and share information from participants to help with arranging carpools. The Reggio-Inspired Network has reserved a block of 15 Standard Double Queen rooms at the Hampton Inn. Address: 440 W. Johnson St., Madison, WI 53703. Cost: $169 a night for Friday 4/12 and Saturday 4/13 and includes breakfast. Preschool of the Arts, a Reggio-inspired early childhood program in Madison, Wisconsin, serves more than 200 children and employs a team of full-time art and music specialists. Come learn about how these teaching artists and musicians collaborate with the classroom teachers to create vibrant, responsive, child-centered studio experiences. 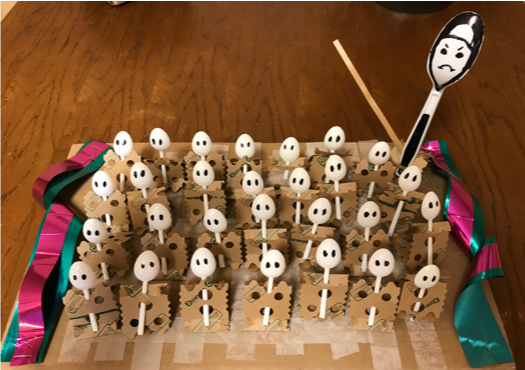 In this workshop, we will explore the Reggio Emilia concept of “the hundred languages of children” through conversation, demonstration, participation, and reflection. Cost: $35. Advance registration required (Note: we need to have at least 10 people register to hold this workshop). See registration above. Reception and Orientation to the Exhibit: “Setting the Stage” in the Hampton Inn meeting room. Wine and cheese reception to informally meet with others from the Network who will be touring the Exhibit. Prepare to visit the Exhibit and explore introductory questions together. Lunch is on your own. We will suggest places to eat within walking distance; we can have lunch together in small groups for further conversation. Post-Visit Discussion – Meet in the Program Room at the Central Madison Library. We’ll gather to think and talk together about what we’ve experienced. The exhibit is open 1 to 5pm. You are welcome to explore on your own or in self-forming groups. I was able to attend a Documentation Lab in the early spring with Marshall Anderson, kindergarten teacher at Friends School of Minnesota. As the assistant head of school, my role is to support teachers and provide the resources they need to do their jobs as an aspect of ensuring the strength and vitality of the overall educational program. For many years, Marshall and I have been in dialogue about the Reggio-inspired concept of seeing children as capable. We have explored how to provide sustenance and guidance on children’s journey of discovery about themselves and the world around them. We have supported each other to increase and deepen the practice of listening to children, following children's interests and identifying ways to document what the children are learning, in order to inform what might come next. Yet, for twelve years we have struggled to maintain an intentional and focused practice of reflecting on children's learning as it is happening. School is a busy place packed with the unexpected and fluid nature of many small bodies moving in time and space. The urgent can crowd out the important and, before we know it, we are on the downhill side of the school year and summer is fast approaching. At the Documentation Lab I somehow experienced time being stretched out in a thoughtful and deliberate process using a protocol (Documentation Lab Protocol) through which to view and think about children's learning. The protocol promoted a lively and robust dialogue as we explored and mused over a series of pictures documenting the dramatic play of a group of preschool children. It was fascinating to hear others’ thoughts and questions and, equally intriguing, the silence the protocol required of the presenting teacher. It created such a deep curiosity and openness for seeing possibilities. It brought to mind a reoccurring mantra... All teachers deserve this time, all children deserve this reflective "gaze"
Ideas in Motion, by both Cagliari and Soncini: https://www.mnreggio.org/Blog/6111777). Most profound to me was the realization that I, the administrator, need this time with teachers. I need to see what teachers notice, what they hold and what they wonder. The Documentation Lab has fortified my role in ensuring there is collaboration time for teachers during school, to embed the seeing and wondering into our weekly schedule. I want to elevate the learning journey between the teachers and the children, to commit more fully and deeply to the power and promise of what comes from observing, collaborating and documenting. Part of my responsibility is to provide an administrative "gaze" of understanding and honoring the reciprocal nature of teaching and learning. The Documentation Lab was a wonderful experience and reminder of the power of collaborating and thinking together about the capacity of children to learn and to teach each of us everyday. I encourage teachers and administrators to come to any one of the Documentation Lab gatherings that will be coming up, resuming in the fall. The meetings are free, held in various locations around the cities and you can participate fully, whether or not you bring student work. Joanne Esser can provide further information (jesser@blakeschool.org). The dates will be announced on the Reggio-Inspired Network of Minnesota website. Professor Dr. Sabine Lingenauber has pulled together her research on the women of Reggio Emilia and collected it all in this website, Visions for the future - A documentation by Sabine Lingenauber. This website reconstructs the rich contributions of women to the history of the Reggio Emilia Approach (1943-1973). The narrations of Ione Bartoli, Eletta Bertani, Giacomina Castagnetti, Loretta Giaroni, Lidia Greci, Marta Lusuardi and Carla Maria Nironi bear witness to events that should be remembered. They show how female partisans, citizens, councillors, politicians and municipal councillors influence the development of a new form of education (Reggio Emilia Approach) in Reggio Emilia from the Resistenza (1943–1945), to the women’s movement and up until today. 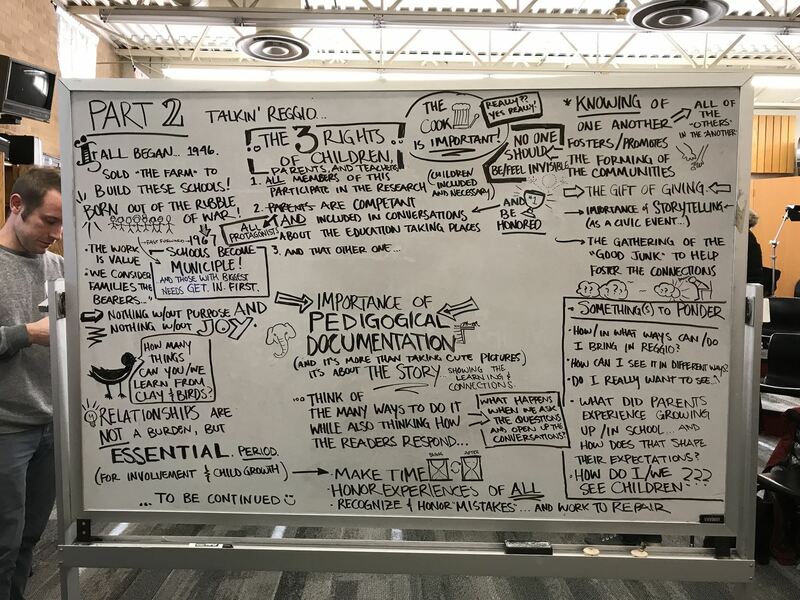 This autumn, the Reggio-Inspired Network of Minnesota created our newest initiative, the Documentation Lab, as a way for educators to share our documentation practices with each other and to practice critically analyzing the documentation we study. Documentation is one of the most essential practices that the educators in Reggio Emilia, Italy developed and modeled, a way of looking at children’s thinking that has inspired authentic child-centered practices in schools around the world. One definition of documentation in the Reggio sense is: “a process for making pedagogical (or other) work visible and subject to dialogue, interpretation, contestation and transformation,” (Gunilla Dahlberg, in The Hundred Languages of Children). It is only through sharing with other thoughtful educators the visible traces of our work with children that we can more deeply understand and support the children’s work. The Documentation Lab creates a forum for comparing interpretations, providing multiple perspectives to inform our practice, whether we are presenting documentation or we are participants studying another’s work. The Documentation Lab met three times so far, once a month. Each time we gather, one participant offers visible (or auditory) observations from their own work with children. These could be photographs, video clips, transcripts of conversations, anecdotal notes, work samples done by the children or any other tangible recordings of their thinking and play. Then the group follows a specific step-by-step discussion protocol that we are adapting from a process used by Steve Seidel and colleagues at Project Zero. We spend time in turn to observe, describe, raise questions and speculate about the work we see children doing in the traces offered. Then the group hears more from the presenting teacher, who has been listening all along to what was said about the children’s work. Finally, together we discuss implications for learning that have arisen from the conversation. Perhaps the place in the structured conversation where the deepest learning happens is discussing the implications for teaching, learning and understanding children’s strategies. Everyone is invited to share thoughts stimulated by examining the work. One of the big questions we consider is, What could we do next or differently to move this learning forward? For example, in October, Bridget Keefe, a teacher from St. David’s Center, brought a series of photographs she had taken of toddlers interacting with one another. After studying the photos of the toddlers, the group considered ways that the teachers at St. David’s might share their insights with the children’s parents and gather the parents’ perspectives. We wondered whether revisiting the photos with the children themselves would result in language that could further illuminate what they were doing, and whether adding some of the teachers’ own questions to the display of photos might highlight for families what they were noticing. 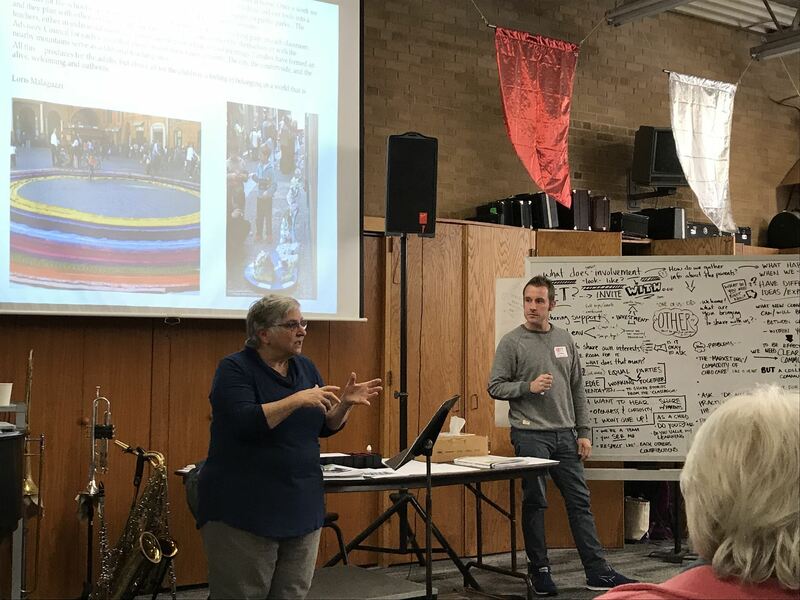 Because we are studying real traces from real children in our own Minnesota teaching practices, rather than hypothetical examples or experiences retold from Italy, the Documentation Lab process allows us to directly examine our work in practical ways. We hone our skills at observing, critical thinking and planning in collaboration with supportive colleagues. Then we can return to our own settings and apply to our work with children what we have discovered. This is the essence of Reggio-inspired practice. For example, in October, Bridget Keefe, a teacher from St. David’s Center, brought to the Documentation Lab a series of photographs she had taken of toddlers interacting with one another. 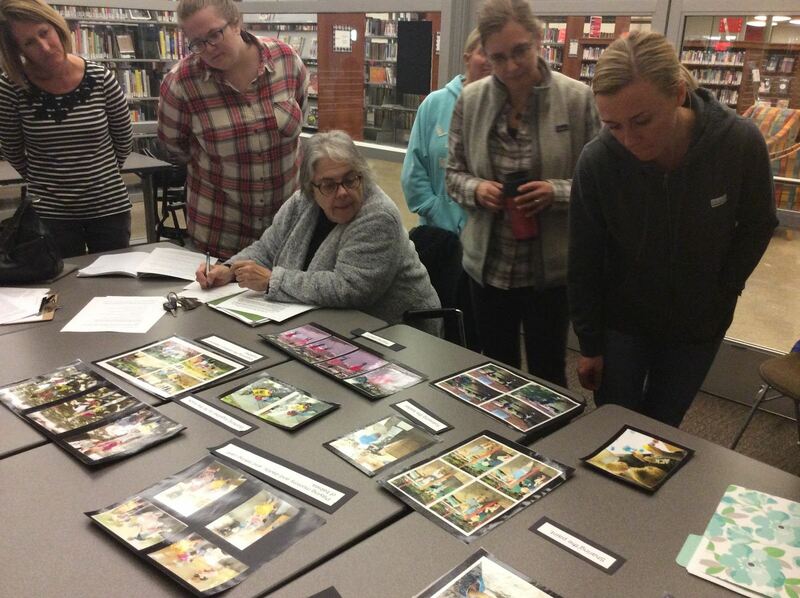 She laid out the photos on the big table and the group of fourteen educators silently observed the photos. Then we took some intentional time to describe what we noticed in the photos – withholding any assumptions or judgments, not evaluating the photos or mentioning any personal preferences– simply answering the question “What do you notice?” Bridget took notes on what she was hearing. Sometimes people noticed details she had not previously recognized, even though she had taken the photos herself. We went on to raise questions about what was happening in the photos. Bridget did not answer the questions at that point, but a note-taker recorded them, since the questions the documentation raises are important in themselves. A few of our questions about the toddler photos included: How much are the children verbally communicating? Are they playing together with each other, or is the play more about the objects they are using (like a ball, a paintbrush, a toy)? How well do these children know each other? What instigated the action? What was the provocation? How have these photos been shared with parents? What were the parents’ perspectives? Does this represent toddlers in general, or is this a unique group? We went on developing questions until we had approached the photos from every possible direction. Next we speculated about the photos, guessing what the children were working on, their skills, their theories and motivations. For example, perhaps their game of playing “catch” with a ball was a way to practice give-and-take, to make social connections with another child. We saw examples of toddlers seeming to solve problems and communicate nonverbally through the use of materials. We speculated as well about the point of view and values of the educator who had taken the photos, how she seemed to want to highlight the children’s interactions with each other and their confidence. 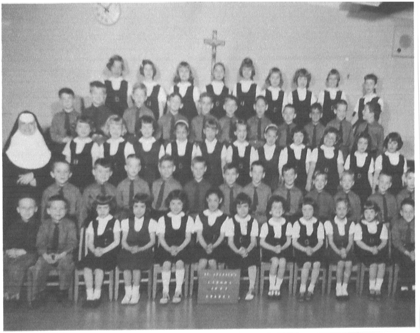 When it was the presenting teacher’s turn to speak about the process, Bridget answered some of the group’s questions, such as how long the children in the photos had known each other and what her intentions were in taking and displaying these particular photographs. She shared how her toddlers are seeking each other and how she observes them moving from parallel play to cooperative play. Our hypothesis was that toddlers working together in this way over time grow more in language, communication and social skills. Each month, we have new material to study. In November, Joey Schoen, a teacher from Dodge Nature Preschool, offered a transcript and audio recording of an active dramatic play scenario her children enacted, involving “dangers” like a tornado, “bad guys” and a fire. It led to a rich conversation about how the role of adults can foster – or interrupt – children’s imaginary play. 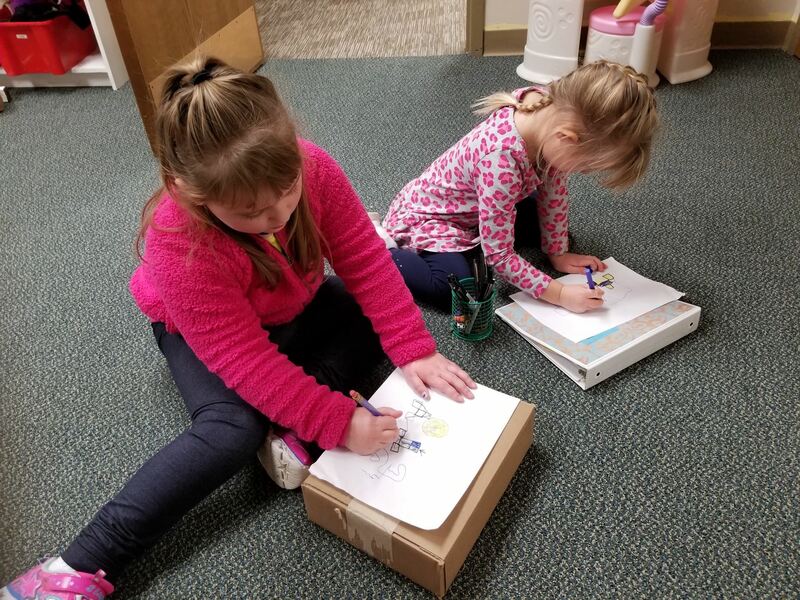 In December, Stephanie Ponticas brought many photo scrapbooks she has put together over a number of years to show the wide variety of activities the children at her home childcare engaged in. The discussion centered on the format of the documentation itself, the difference between “memories” and “learning stories,” and ways we can most effectively communicate children’s experiences and thinking. 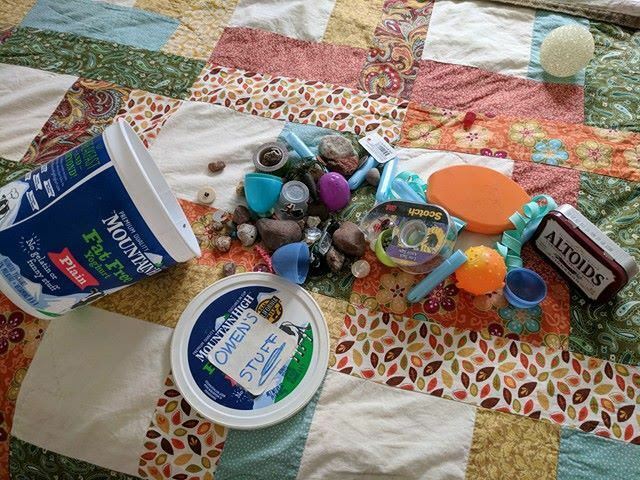 “When do we stop noticing the little things?” This question came up while discussing the network’s Geography of Childhood project and I immediately thought of my friend Sarah and her child, Owen, and his somewhat epic treasure collection. The Geography of Childhood is in part an investigation of the children in our communities and what childhood is lived like today. 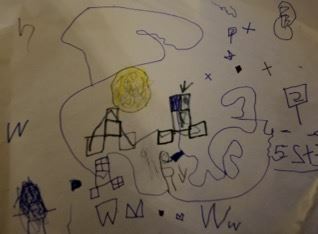 My interview with Sarah tells a story about a 5 year-old who constantly takes home little things that he has noticed. It’s a reminder that people of all ages need time and space to make connections between all the little things that our larger ideas are built from. It’s a story about how one parent provides for that, when she could easily choose to make things more convenient for herself. Have I myself stopped noticing the little things? I see tiny treasures and sense little mysteries just as much as Owen, but there’s no time to dig in. Now, I have to collect and save little pieces of my schedule, scraps of evenings and weekends, to use for reflection and connection, the way that Owen tries to hold on to every bubble gum wrapper for his mini-comics. And that’s not the way I want it. At home and at school, I’d happily trade away every educational device, every light table, every tree cookie, magna-tile and mirror, I’d give up so much of the stuff if it meant more time to just be present with the people. Owen’s play ends up having a significant impact in the world of adults. Could this be more common if there was more space for children in the "real world"? Ultimately, this story is intriguing to me because of the way Owen relates to people; his grandfather, his teacher, his mother and more- through his collecting and creativity with his treasures. Sarah: Since Owen was an infant everyone is like don’t put anything in his hands that he can choke on. And that’s all he wanted to do was hold on to, like, acorns or little bowls or anything. He just always wants a little something in his hands. I think it’s just that tactile… partially tactile, but he likes the little things. Damian: Is it also kind of the magic of finding something? S: A little bit. He’s also very good at that. I don’t know. He’s just always done it. D: Do you often catch him crawling underneath stuff, or moving furniture in order to see what’s behind it? S: More crawling than moving I think. The sandy playgrounds are his favorite, I think, because people drop stuff in them all the time, and it’s the treasures he finds in those that I think are like the most exciting. And then he kind of hoards them away. D: Where does he usually put his treasures? S: Usually in that little container or the shelf by his bed. That yogurt container. . .That’s all my dad’s doing. It originated at my parents farm, because when we go there usually it’s usually like my brother in law and my sister and he kids, so it’s all cousins, and he always brings home a metal detector. Which reminds me of finding stuff on the ground. Because it’s a 100 year old plus farm house. People just dumped stuff wherever. And we find crazy… like, most of it’s junk, but it’s like horseshoes and old pocket knives and old money and just you know like parts of cars and who knows, you know? So you find all this stuff and then… and there’s rocks in the driveway, cause it’s a big ‘ole gravel driveway, so owen holds a lot of that, so my dad pulled out that big container. 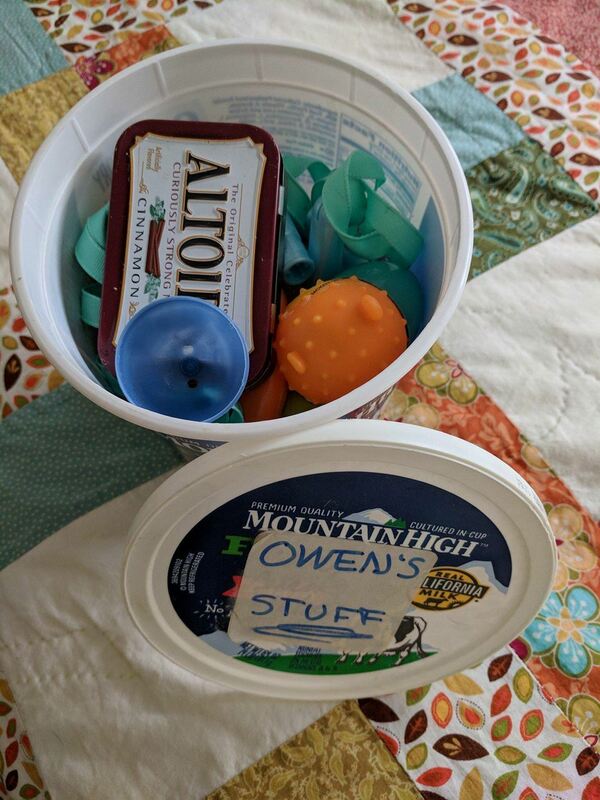 He’s the one that wrote “owen’s stuff” on the lid. That’s all him, my dad. So that’s where it came from. He had all these rocks and bits from digging in the dirt. D: And then what does he do with the stuff, like, after he collects it is that it? He just holds onto it like a dragon? S: They will spark ideas I would say. Like, he says “Oh! I gotta go do something and then he’ll go rummage through his pile of… you know. D: I can hear your opinion of it. Pile of garbage. S: (laughs) I mean it doesn’t bother me but it’s pretty much literally garbage. . .
S: Exactly. So he’s like, Oh, I just gotta go do something.” And then once he gets that idea he can’t stop it. He won’t go to bed. He won’t do anything until he finishes what that little thing he’s doing. And he’ll often times go pull out something that he found who knows how long ago. It’s like he has an inventory. D: That’s interesting. He knows everything he’s ever found. S: He has a memory for that stuff that I never had. D: Because it’s important to him. Can you remember a specific time when times when he wouldn’t go to bed? S: . . . A lot of time it’s at night time when you’re really frustrated and you’re like “Just go to bed” and he’s like “No. Wait. Where’s the glue . . .
D: And you’ve had to make sure he doesn’t steal stuff that he finds interesting. S: Once I was cleaning out his backpack and there’s this gold cross on a pendant. 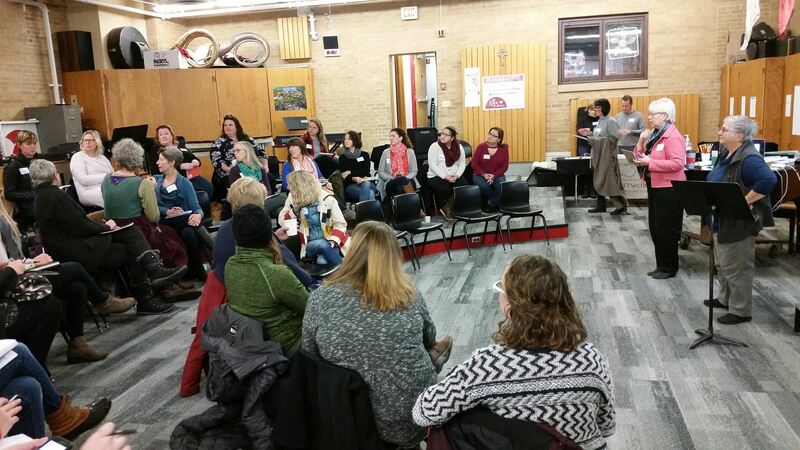 At our most recent Saturday Gathering, parents, educators, administrators, and citizens gathered to collaborate around the topic of Parent Engagement, facilitated by Lani Shapiro, in a session titled "Whose Agenda Is It? Mapping the Terrain of Parent Engagement from Multiple Perspectives." We framed our discussion around the following questions . . .
What do we, as educators, mean when we promote 'parent involvement'? What do families have in mind when we seek to be 'engaged' in our children's education? 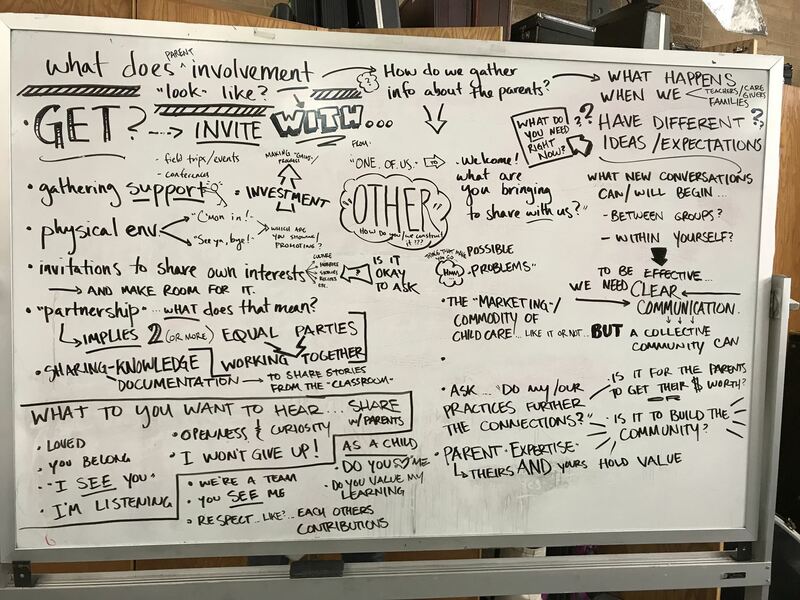 How do communities understand 'being involved'? We will discuss these questions, as parents, educators, administrators and citizens, framed by ideas from Reggio Emilia. How do we construct shared agendas? We discussed Loris Malaguzzi's "A Bill of Three Rights," expressing Reggio Emilia's view of the essential participation of each of the protaganists in their educational project; children, teachers and parents. Our discussion generated a spirited dialogue which raised new questions and considerations . . .
· There is a difference between “getting parents involved” and “inviting families to participate." Which way leads to a feeling of “belonging”? · Sometimes we have to persist in our efforts to encourage families to participate. One way to approach families that do not respond to our initial invitation to participate might be, "I know you have something to offer, and I’m genuinely interested in that.” How can we let families know that we genuinely value them and see them as equal participants? · We have to remember that not all families have positive memories or associations with school. How can we reframe parents’ perceptions about school by developing positive relationships with both children and parents and persisting in our invitations to partnership? · “I cannot assume the way I bring myself into a community is the same for everyone else.” How can we clearly communicate that we value everyone’s unique qualities? How do I check myself to ensure that I AM valuing everyone’s unique qualities? · Do we offer a variety of opportunities for families to participate in the life of a school in ways that work for them? How can parents share the responsibility for educating their children once they arrive at our schools? How can schools make room for them? · Some ideas that may work: Invite parents to stay and eat breakfast with their child at drop off time, come in and eat lunch with them, or have “brown bag dinners” at pick up time. Invite parents to co-teach with you. Read a story or tell a story, sing a song, bring in a CD for us to listen to, lead an activity, play a game, share a talent or skill with us. The possibilities are endless. How can we include everyone in ways that make them feel valued and competent? What are your ideas for creating schools of participation, schools that include spaces, contexts and times so that all children, parents and teachers can speak and be listened to?